Yusra Siddiquee | Littler Mendelson P.C. 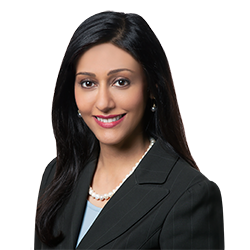 Yusra Siddiquee leads the business immigration and international mobility team in Littler's Toronto office. Yusra develops corporate immigration strategies and facilitates the temporary and permanent entry of senior executives and key personnel of Canadian and multinational corporations. Her practice is not limited to Canada, as she is experienced in facilitating visas and permits to global destinations. With comprehensive experience in immigration law spanning over 20 years, Yusra is able to advise employers on alternate jurisdictions to relocate key employees who are unable to secure immigration status. She also assists companies in determining the human capital costs when bidding on international projects. As well, Yusra provides extensive training to human resource professionals and in-house counsel on the implementation and execution of immigration policies and processes. From an employment law perspective, she advises clients on the employment and termination of foreign workers. Yusra’s clients span a wide range of industries, including engineering, telecommunications, information technology, health sciences and energy. Yusra has appeared before parliamentary committees to advise government officials on immigration policy and legislation. She is a frequent speaker at legal and industry conferences both domestically and internationally. She is ranked as a leading immigration lawyer in several publications including Chambers and Partners, Who’s Who Legal and Canadian Legal Lexpert.